3pm – 6pm – Please arrive at the InterContinental Hotel – The O2, 1 Waterview Dr, East Greenwich, London SE10 0TW. 3pm – 7.30pm – Registration inside the hotel. Please bring with you identification, either your driving license or passport, all team members must check in to receive their wristbands and lanyards. STICKERS – You will collect your stickers and goody bag at registration. You will then need to apply your stickers to your car, this will take around 30 minutes. Once you have completed registration you can check into your hotel room. 9pm – Welcome evening begins. Dress code for evening – smart casual, no trainers of ripped jeans. SEE BELOW FOR THE START LINE LAYOUT – do not arrive before 3pm. When you arrive look for Modball marshals to direct you. 5.45am. If you are using the luggage vehicle (1 suitcase per team) you must take your case to the luggage vehicle located outside in front of the lobby at 5.45am, the luggage vehicle leaves at 6am. 6am – Head to the stunning Clipper Bar to pick up your breakfast and enjoy a coffee overlooking the cars on the start line. 6.30am – Rally briefing in the Clipper Bar. In the briefing held by Tom TGE and Jon you will be told how the points system works for the event. 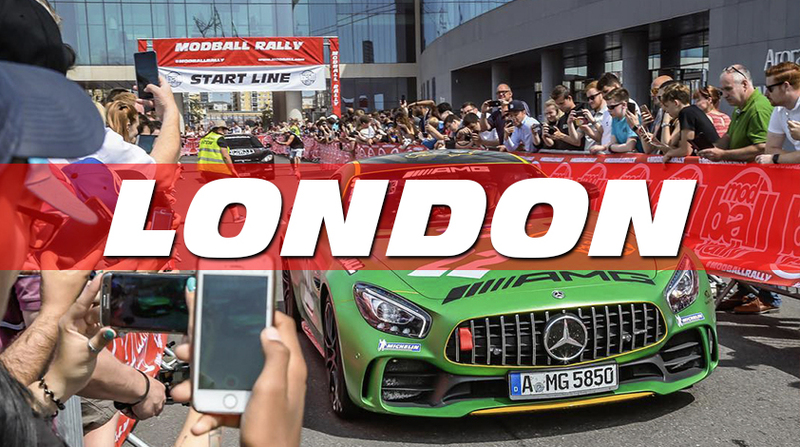 6.50am – All Modballers must be inside their car ready for the start. 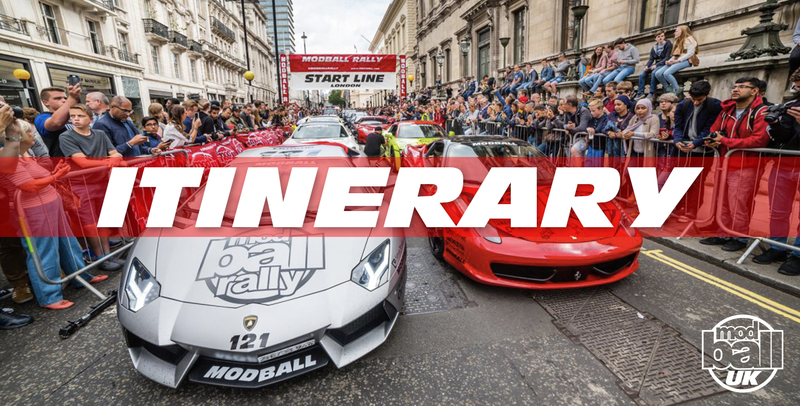 7am – Cars depart for the start of Modball UK. SECRET CHECKPOINT – Details to be added closer to the event. 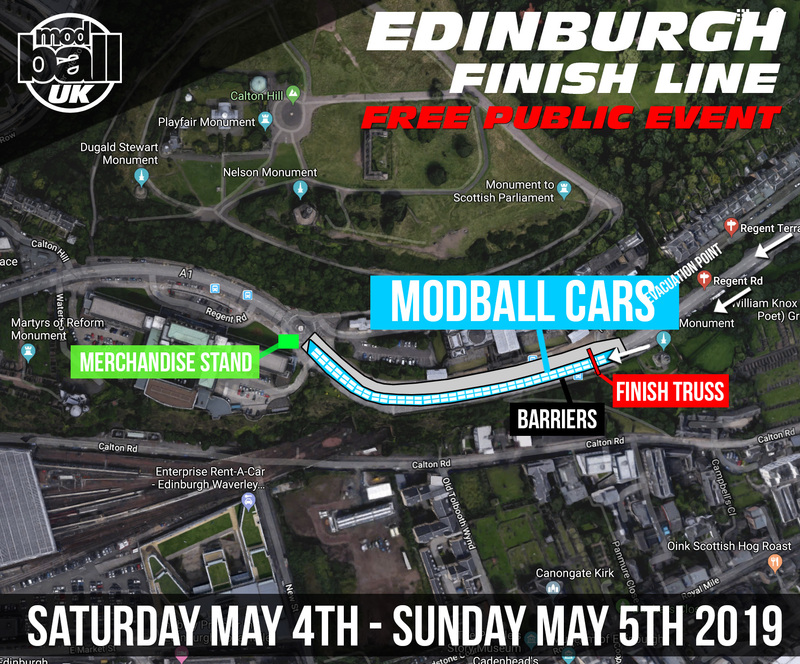 We are closing down Regent Road in Edinburgh for the Modball Rally UK Finish Line this year! You have the option to leave you car at the Finish Line overnight with our security or you can park it at the Sheraton Grand Hotel. 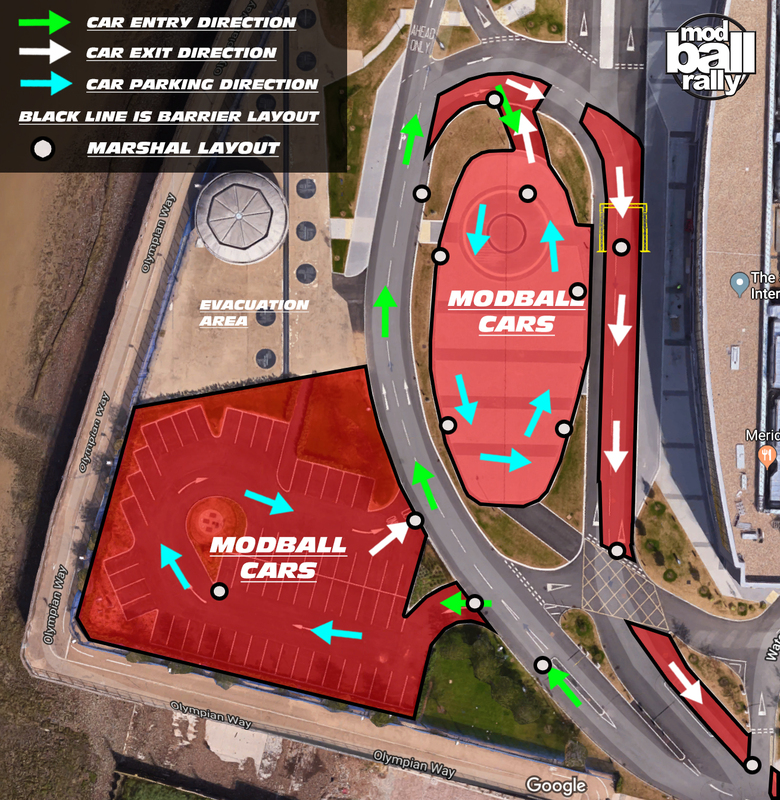 Full details will be given on this page the day before the event so Modballers are fully aware of the location including the direction to enter from and exit the site. We will also provide Google Map links for everyone. Make sure you’re ready with your black tie suit and ladies 1920.s outfit. See our Party post for full details. Location and times to be listed here just before the event. AFTER PARTY – details to be added closer to the event. 9am – 10.30am – Departure Farewell – Regent Road Edinburgh. Grab your car and head back to the Finish Line or head over to collect your car ready for the departure farewell. All of Edinburgh is invited to see the Modballers depart for home in a big farewell. Make sure you look out for our photographers which we will be sharing on social media. Once you have left the Finish Line you are free to head home.